“My battery is low and it is getting dark” made nerds everywhere get a bit weepy last month. However, as Scott Manley explained in his video, Opportunity never actually sent a message with those words. The data in transmissions NASA received showed that Opportunity’s batteries were indeed low (the solar panels were only generating 22 W-hrs a day) and the sky was getting dark . . .
My husband and I got married at the exact moment of the autumnal equinox of 2016. Why? Partially opportunistic as we wanted to get married late September anyway. But the reason why it was an opportunity worth taking is it actually is a significant time of year for astronomy nerds. As Neil deGrasse Tyson has commented on, New Year is actually a non-event as when the year starts is completely arbitrary. However, it’s not a coincidence Christmas is near the winter solstice and that the date of Easter Sunday is usually the first Sunday after the first Full Moon occurring on or after the March equinox. Speaking of Neil deGrasse Tyson, my dad wore a waistcoat that he would be jealous of for my wedding . . . 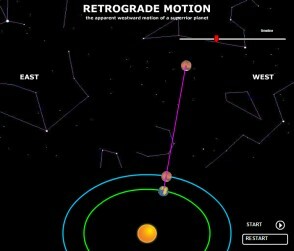 This is an animation from the University of Nebraska-Lincoln showing the retrograde motion of Mars. Over 9000 downloads of my resources! My TES resources have been downloaded over 9,000 times! You can check them out here. Read more about Over 9000 downloads of my resources!